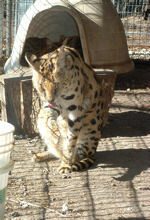 Dakota came to us along with two other servals, Gypsy and Tramp, from a sanctuary that claimed the three lived together with no problems. Based on this information, we built one large enclosure to house the three servals so they could continue to live as they were accustomed. Being such a friendly fellow, Dakota quickly became a favorite with the volunteers and staff. He emitted a certain sweetness that could clearly be seen in his eyes. He apparently had been a pet prior to being placed with the previous sanctuary. Because of his loving personality we were able to provide hands-on care for him. When cleaning his cage, Dakota would follow us around, rubbing his nose on our legs and slobbering all over us. We gladly spent time with him, watching his antics and being the recipient of all the love he wanted to bestow on us. At feeding time he would always insist on being the first fed. He would put his paws through the fence in anticipation of getting his food and made it very clear to his cagemates that he was to be served first. 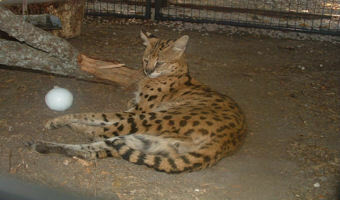 Not long after we took the servals, Dakota and Tramp began fighting. It became obvious to us that the two had probably never been housed together and that we were told an unfortunate falsehood by the previous owners in hopes we would find it easier to accept and accommodate their three servals. At the first signs of aggression, we began to build another enclosure so that we could separate Dakota from Tramp. Sadly, Dakota did not live to enjoy his private enclosure. On December 27, 2005 we found Dakota curled up in his bed asleep forever. Dakota had suffered heart complications after a scuffle with Tramp during the night and died a senseless death because of false information. Sweet, gentle Dakota touched us all.